Dominoes are popular all over the world. And the Mahjong, which original come from China, is similar to Domino. Dominoes are played in different ways in different areas while the luminous marked dominoes are useful for the players in every place. 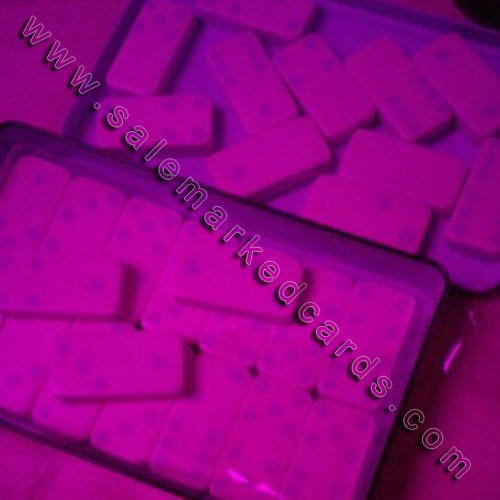 With the marked dominoes, people can see the clear marks of the same numbers as the face on the back when wearing the infrared contact lenses or sunglasses. However, people can see nothing different on surface of the back between normal clean dominoes and our marked dominoes. We supply many kinds of dominoes here. We have metal box packs, wooden box packs and also plastic packs with color dots or black dots. You can get dominoes of Double-6, Double-9 or Double-12 from our company. And if we don't have the dominoes that you need, you can also send us your dominoes to proceed.